When we asked our Facebook fans a few weeks ago about what kind of discounts and promotions they/you would like to see, we were practilly overwhelmed with ideas! The most common request was for 50% off one item. Since we actually *can't* make that happen with our system (I know, bummer) we modified it to a $25.00 off any order over $50.00 instead and boy was that a hit! The second most popular idea was for a free quote with your order and we thought this was an exceptional idea. Michelle (whose original idea it was) has been helping us with the design, but now we need more help - your help. Have a look at these options here and vote for your favorite (in the comments below). The design with the most votes will be included in every order over $75.00 placed between March 1st and 31st. (It'll be approx. 6" tall x 24" wide in Black and you must enter the appropriate code - yet to be announced - at checkout to qualify). 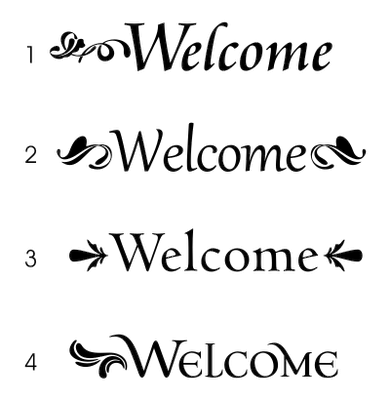 I like the decal included in #1 but prefer the look of one on each side of "Welcome"... so #2.
hmm, this is probably no help but I LOVE the text for #4 but need something symmetrical (decal on both sides)... so I'm torn. ...But I DO love the text on #4, THAT i know! I like No 2 - I'm with The Mayhews, I don't like the antisymmetry (asymmetricality?) of the design on one side. Can I have two votes? Wink, wink! It's tough between #2 or #4 in that order. A vote for symmetry and asymmetry, respectively. I like #'s 2 and 3, because I like symmetry. I also prefer the symmetrical design, #2 is my fave, but I really like the font in #4.